The book's editor, Catherine Labaume-Howard, found 300 of her grandfather's letters in an old potato sack, when a family home was sold. The author of the letters, Pierre Suberviolle, was from Montauban, in the south of France. He joined the army on 7 August 1914, without his father s permission, when he was only 17. He wrote to his family (and particularly to his mother) regularly during the next 51 months. Mobilized as a car and truck driver, he fought on the western and northern fronts of France. Soldiers normally did not say exactly where there letters were from, but Pierre was definitely at Dijon, Villers-Cotteret, Vitry and Soissons in the first months of the war. At Ypres he experienced the early use of mustard gas. He was then sent to Greece, Salonika, Macedonia and Albania for 18 months. When he was sent back to France, he was trained for tank warfare and sent to Belgium where he was wounded and lost an eye one month before the war ended. 150 letters were selected to create this book. Pierre writes with great fluency, in a very straightforward style. The war is the one permanent feature of these letters, and the book makes a contribution to understanding the life of the ordinary poilu during this period. The letters from Greece and those about the tank warfare are particularly interesting. But we also get a realistic picture of French provincial middle-class life at the beginning of the 20th century - family ties, financial problems. The English reader will probably note Pierre's deeply affectionate and emotional tone, compared to the more stiff-upper-lip approach of British soldiers. He writes poetically of nature (as many British soldiers did), and he has a real sense of humour. This is also a book about a young man's coming of age over a very short and stressful period of time. 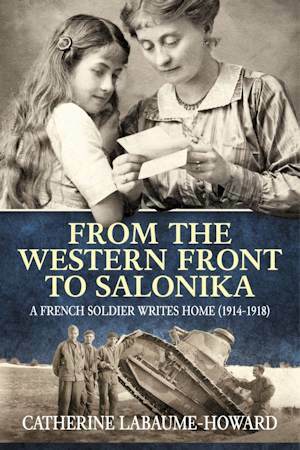 The book is very generously illustrated, with many photos taken on or near the front line by the author himself. Some photos of French and German tanks are unique. These have never before been published. There are also illustrations of maps used by Pierre, picture postcards of places he visited, and even rare documents such as an official note warning the soldiers in Greece to beware of The mosquito: that is your enemy!! !